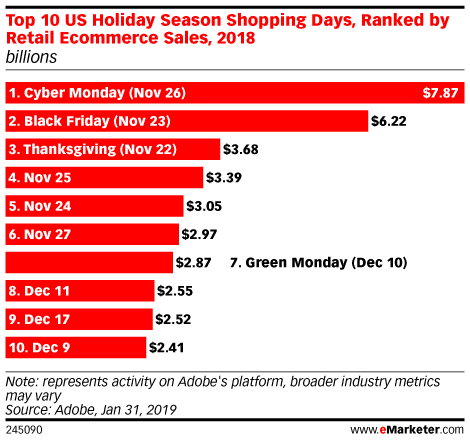 Data was provided to eMarketer in January 2019 and is based on analysis of aggregated and anonymous data from the Adobe Experience Cloud, Adobe Analytics Cloud and Adobe Advertising Cloud. The analysis is based on a daily revenues model based on analysis of more than 1 trillion visits to US-based retail websites. Product and pricing insights are based on analysis of sales of more than 55 million unique products. Adobe Analytics measures 80 percent of digital transactions at the largest 100 US digital retailers.